While operating a full time health clinic in 1998, Global Healing Center Founder and CEO Dr. Edward F. Group realized that he wanted to reach and help people beyond the walls of his practice. He became obsessed with finding a way to spread the message of health, happiness, and nutrition to the global community. Our mission is to provide access to natural health information and products that revolutionize your journey to better health. We believe in cleansing your internal and external environment to restore your body's self-healing mechanisms. We began in a small, 200 sq ft office with just two employees and a man with a vision. We spent countless hours in health forums addressing the concerns and answering the questions of the online community that the medical industry couldn’t and wouldn’t answer. This was pivotal in the development of our company and the first Global Healing Center brand products were created in response to customer feedback and needs. We quickly realized we had a responsibility to provide the purest, all natural, and vegan safe supplements and cleanses available. What began as one man’s simple idea has since evolved into a global brand and a leader in the natural health industry. Today we offer a wide variety of high-quality, green-living lifestyle products that are designed to help anyone (yes, that means you!) lead a clean and healthy life. 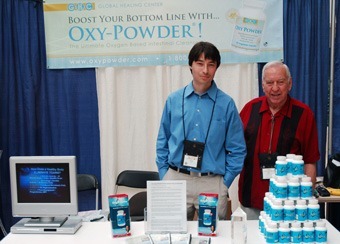 Nearly 20 years later, Global Healing Center remains dedicated to the success of our customers. We use state of the art manufacturing, and the latest technology to produce the highest quality, all natural health products available. We’ve made it a point to foster a culture of innovation and have built a team of talented individuals to further our mission. We believe in hiring people who have a passion for customer service and are willing to work as hard as they play. The energy, time and effort each employee gives is reflected in the success of our customers. We are here to educate, support, and provide the tools necessary to live a long, healthy, and happy life. The American Herbal Products Association (AHPA) is the national trade association and voice of the herbal products industry. Founded in 1982, AHPA's mission is to promote the responsible commerce of herbal products. Biodynamics is a spiritual-ethical-ecological approach to agriculture, food production and nutrition, and a potent force for change worldwide. CCOF is a full-service organic certification agency and trade association passionate about being the leading voice for organic, and certifying, educating, advocating, and promoting organic. OTA's mission is to promote and protect organic trade to benefit the environment, farmers, the public, and the economy. OTA envisions organic products becoming a significant part of everyday life, enhancing people's lives and the environment. The Organic Consumers Association (OCA) is an online and grassroots non-profit 501(c)3 public interest organization campaigning for health, justice, and sustainability. The OCA deals with crucial issues of food safety, industrial agriculture, genetic engineering, children's health, corporate accountability, Fair Trade, and other key topics. We are the only organization in the US focused on promoting the views and interests of the nation's estimated 50 million organic and socially responsible consumers. A+ Rating - BBB helps people find and recommend businesses, brands, and charities they can trust.